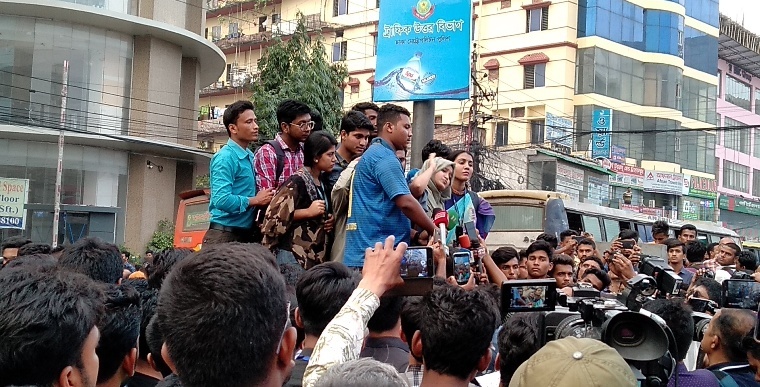 Bangladesh University of Professionals (BUP) students on Tuesday announced all out protest to press home their eight-point demand from Wednesday morning. The indefinite protest programme was declared by Mysha Nur, a spokesperson of the protesters, suspending today’s daylong demonstration following a fellow student’s death in a road accident this morning on Pragati Swaroni. She demanded the implementations of the 8-poind demands including the capital punishment for the the culprit ‘Shuprobhat’ bus driver. “Mayor Atiqul Islam promised us to build a foot over bridge at the intersection of Bashundhara Gate. Road accident victim Abrar father will inaugurate it.” She said. Earlier, Abrar Ahmed Chowdhury, son of Brig General (retd) Arif Ahmed Chowdhury, died in a road crash in Nodda area of Pragati Sarani in the capital on Tuesday morning. The accident took place around 7:15 am when a bus of ‘Suprovat Paribahan’ ran over Abrar, leaving him dead on the spot, said Jahangir, sub-inspector of Gulshan Police Station.